We are tremendously proud of Polpier’s gardens. 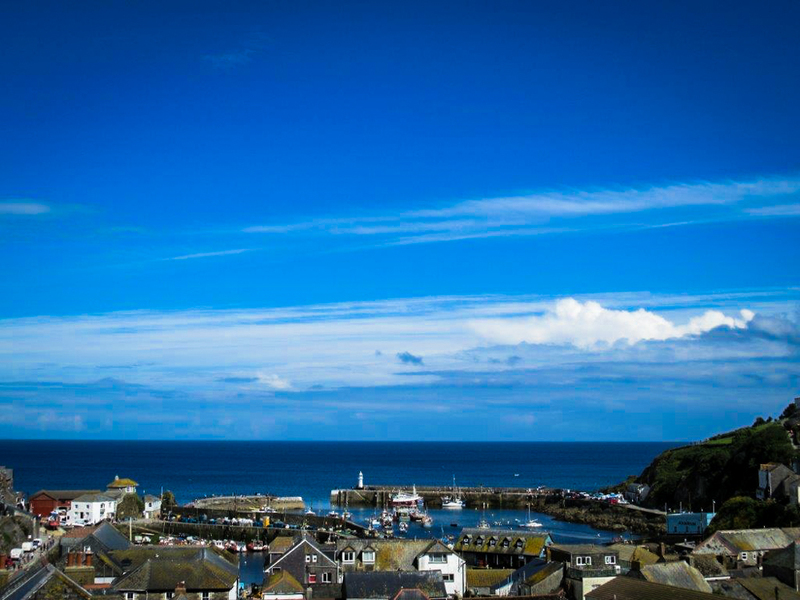 A beautiful sanctuary with glorious views across Mevagissey harbour, designed for our guests to enjoy in total privacy whether on holiday or at a wedding. Every year there are a new, exciting improvements to share with you. Dozens of evergreen oak and magnolia grandiflora trees and hundreds of iris and crocus bulbs have been planted, a Red Burgundy cherry tree walk way established at the back of the house and traditional herbaceous borders created around the front lawn. When the original greenhouse became unsafe, we had to replace it and found, when it was demolished, the site had wonderful views across the sea. The decision was quickly made for the new greenhouse to be built in the vegetable garden and a large terrace and generous herb garden created on the old site. The latest schemes have included taking control of the hollies by pruning them into sculpted pom poms, old privet hedges being replaced by elegant yew and the area around the gold fish pond, where oregano and hellebore flourish, planted up as a yellow garden. 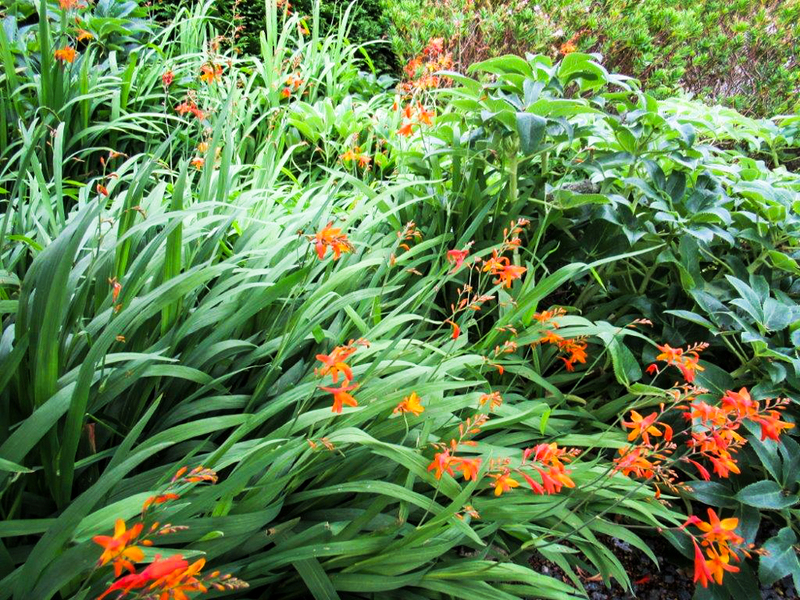 Our gardeners are always happy to discuss the plants and their suitability for your own garden. Please do ask for a cutting of your favourite as a memory of Polpier. If not possible at that time, we are happy to take a cutting at the correct time of year and have your plant ready for you on a return visit. South Cornwall’s mild climate and acid soil means something is always flourishing. The roses have still been blooming at Christmas and the camellias flower early in the New Year. They are soon joined by spring bulbs, azaleas, rhododendrons, magnolias and hydrangeas in a riot of colour. 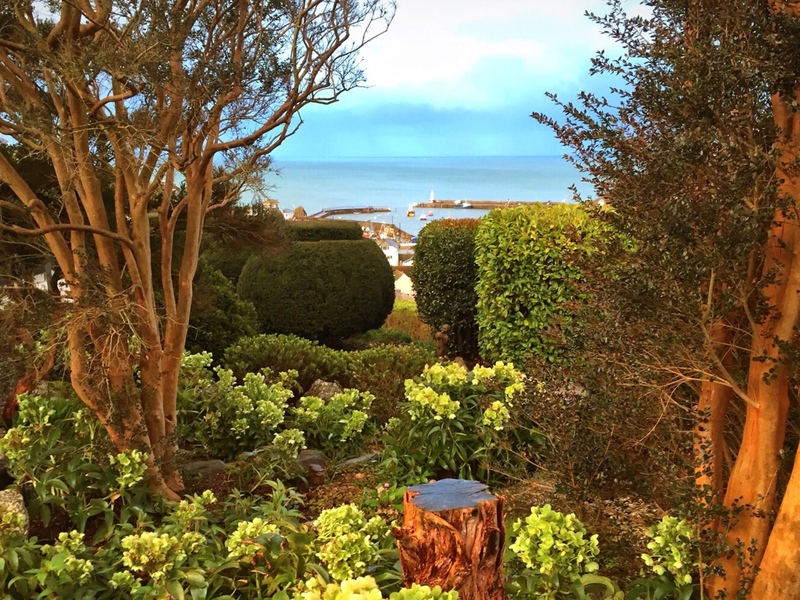 South Cornwall’s mild climate means something is always flourishing in our many flower beds packed with camellias, hydrangeas, azaleas, lavender, fuchsias and hebes. 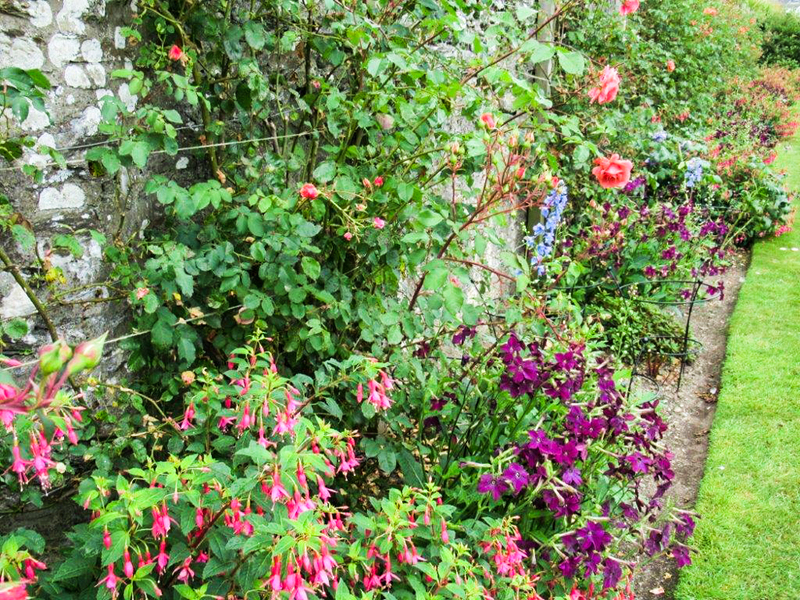 In summer, the front lawn – the centrepiece of the garden – is surrounded by a variety of stunning blooms, including Margaret Brown fuchsias, Coral Charm peonies and Guinevere delphiniums. The air is perfumed with the intoxicating fragrance of Purple Sensation nicotiana and salmon pink Ali Baba climbing roses. Beside the house is the heather rock garden with a granite bench so you may sit and admire the goldfish pond, which is also much loved by frogs. Now becoming the yellow garden, there are Princess Anne rhododendrons and Wisley Primrose helianthemum. A path leads from here to the swimming pool, flanked by purple Tresco osteosperum. Below the path, for those who fancy a leisurely wander, is the terraced garden with winding pathways through cloud-pruned shrubs of pittosporum, olearia, griselinia, cistus, hebe, and evergreen oak. Colour is provided by daphnes, agapanthus and lavatera. Here you will find another nook with chairs to rest and drink in the view. The grass walkway down the terraced garden leads to our wildlife garden of natural bramble and Korean raspberries – which can be eaten by guests as well as birds. The butterflies and bees also thrive here and we like to think we are helping these vital contributors to nature. The top path along the terraced garden leads to the red garden with the foliage and flowers of Chocolate cosmos, Palace Purple heuchera, Tom Thumb pittosporum, County Park Red coprosma and more Red Burgundy Cherry trees reflecting the theme. A quiet, beautiful area, it provides a link between Polpier and Penpol with the pathway gate left open if guests take both houses. Behind Polpier there is a cut flower garden to provide flowers for the house. These include blue agapanthus, hydrangea, Mme Emile Mouillere, and peony Festiva Maxima, both with large white flower heads for dramatic arrangements. 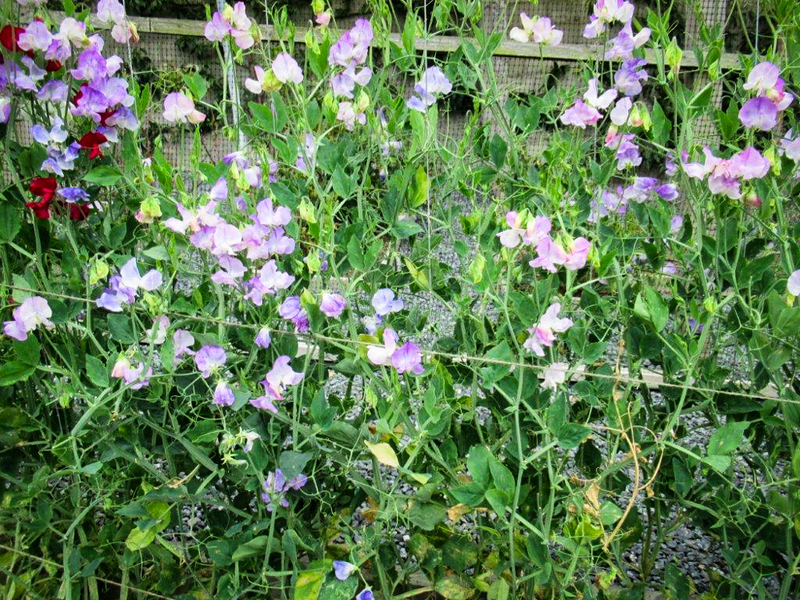 In summer, multi-coloured sweet peas waft a heady perfume. There is also a eucalyptus tree to provide evergreen foliage. The flowers surround a specially commissioned sculpture by local artist David Paton – although one guest did think it was an ornate bird scarer. Also behind Polpier, the pride of the ‘edible gardens’ is the fruit cage. Facing south, it was restored several years ago and planted with black, white and redcurrants, raspberry, blueberry and gooseberry bushes and peach and apricot trees. 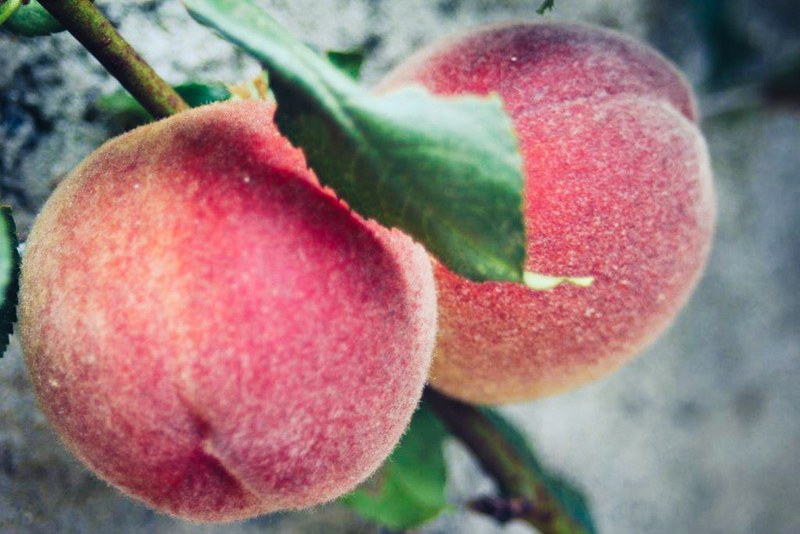 It is a wonderful experience to pick your own peaches to make Bellinis and we urge you to try it. Our tiered vegetable garden has a wide variety of fresh produce for the kitchen, including courgettes, green and runner beans, onions, leeks, artichokes and rhubarb. One large bed is given over to asparagus, now providing a generous crop to enjoy with some creamy Cornish butter. 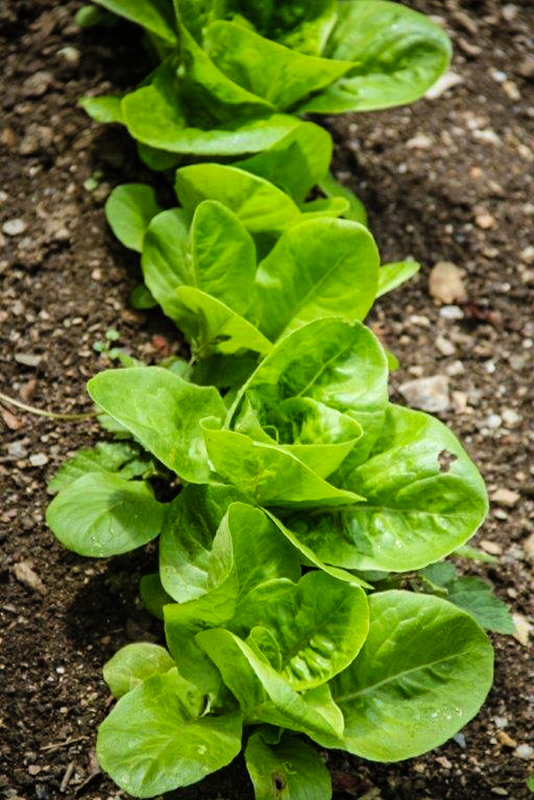 Salad leaves, including rocket, are grown all year in the greenhouse and in summer the tomatoes are ready for your salads or pasta sauces. You will never want to return to supermarket tomatoes when you have eaten a home grown one. In front of the new terrace is the herb garden, with a selection including chives, oregano, thyme, borage, parsley and horseradish for cooking, livening up salads or garnishing cocktails. Try the chocolate mint which smells just like After Eight Mints. The herb garden terrace is also a beautiful spot to admire the glowing sunset over Mevagissey, perhaps enjoying your first Pimms. Sloping away at the back of the Honeymoon Suite, our orchard is well established with variety of eating and cooking apple trees – many of them Cornish. In spring, there are drifts of confetti like white and pink blossom and in late summer and autumn you can bake apple pies to your heart’s content. Adventurous guests have even embarked on chutney making. 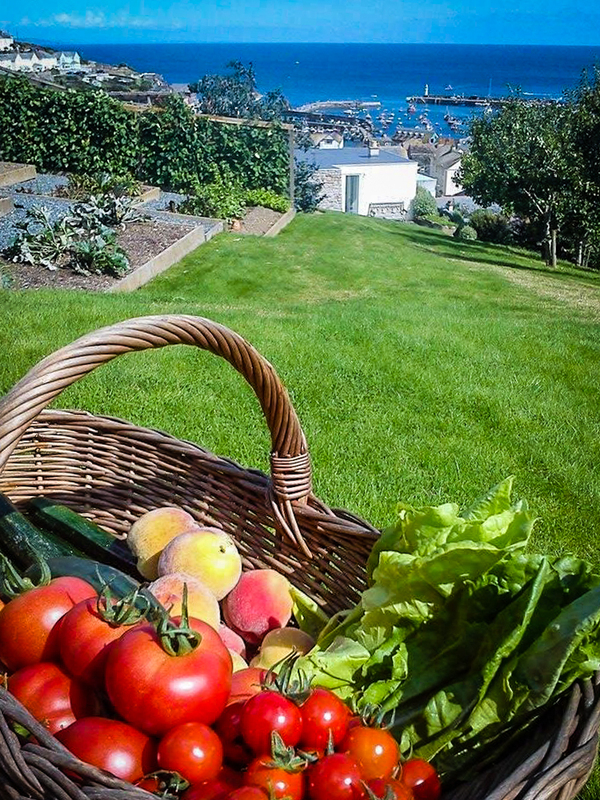 All produce is available to our guests – please pick your own or ask the gardeners for a selection.